We have had the good fortune over the past few years to know both personally and professionally two incredibly talented chefs who now have both written cookbooks that received the coveted James Beard Award…much deserved! 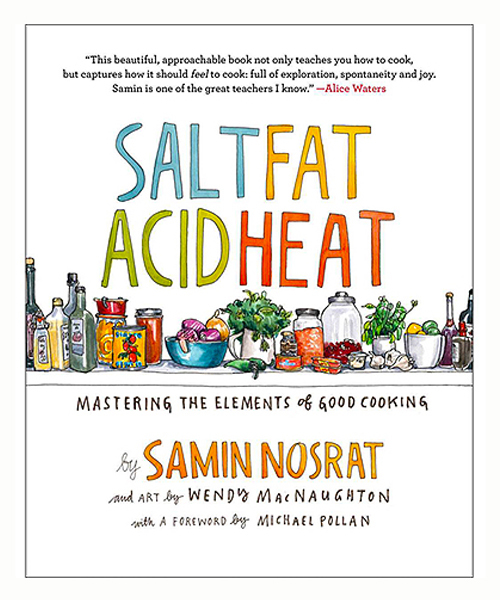 We offer these signed copies, first Joshua McFadden’s Six Seasons, and now the other by Samin Nosrat with and her equally amazing Salt Fat Acid Heat: Mastering the Elements of Good Cooking. Samin has signed each book with a personal note and we are thrilled that she mentions KATZ Farm in the book as well! Samin cut her teeth at the world famous Chez Panisse Restaurant and this is how we met over 10 years ago since, as many of you know, they have been using our organic oils and vinegars in the kitchens for many years. Check out the Four-part Netflix series with Samin as host under the same name, Salt Fat Acid Heat…we think you will really enjoy her food adventures in Italy, Japan, Yucatan and back to California and Chez Panisse where it all started. Samin has a richness about her writing that stands out and engages you, and the fabulous illustrations throughout the book almost feel “tactile.” Yet, she has managed to reduce cooking into simple concepts to help us all make the most out of what we have in front of us in the kitchen….not just the “what” but the “why”, which so many cookbooks fail to do. There is good reason Alice Waters has called her America’s next great cooking teacher…high praise indeed. What I love most about this book is that Samin has somehow found a way to bring both her passion for, and intelligence about, cooking to the page. The results are a book that instructs and delights in equal measure…You will want to make room for this one!